Experience an extraordinary wilderness canoe route adventure on the beautiful Sunshine Coast of British Columbia. A lake to lake campsite and portage circle route for multi- or single day trips. The Powell Forest Canoe Route is one of the finest canoe journeys in the province. Expect enrapturing visuals: soaring coastal mountains laden with cedar, fir, and spruce trees overlook fjord-like waters, and wildlife sightings from bald eagles to black bears. 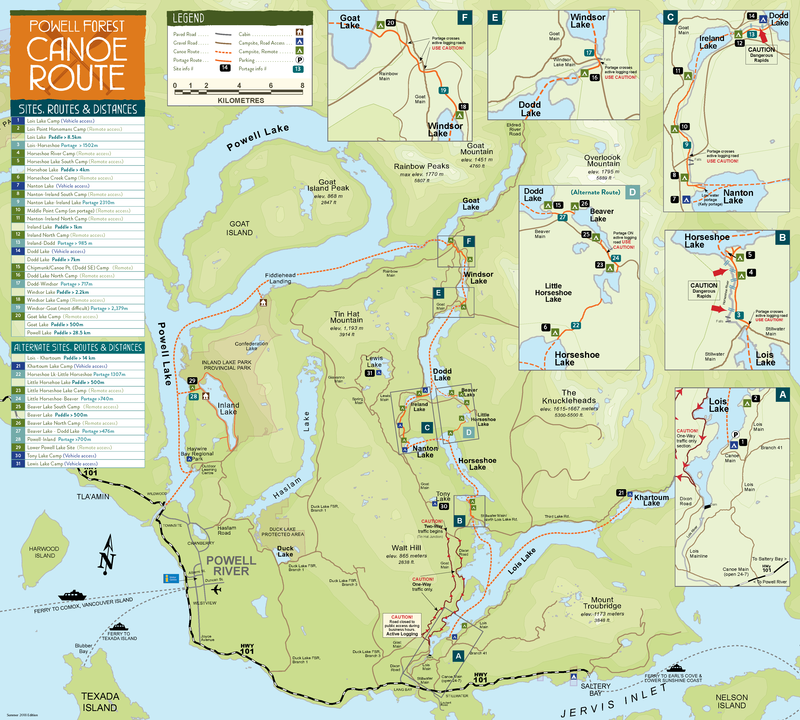 The Powell Forest Canoe Route is a 57 km, 8 lake, 5 portage journey that takes roughly 5 days. Portages range from 0.7 km – 2.8 km, and paddling stretches from 1 km – 28.5 km. The best time to travel the route is from June – October. If you’re not up for the full 5 days of canoeing and portaging you can get a ride to Windsor Lake and descend back down to Lois Lake (~3 days) or get a head start from any point along the Goat Lake Main and take the usual route. Or, you can start at the beginning and canoe to Khartoum Lake (2 days). Whichever route you choose, we strongly recommend not starting from the Shinglemill end as the Windsor/Goat portage is extremely steep in this direction. Once you’re off the ferry at Saltery Bay, drive north toward Powell River for approximately 10 km; you’ll see the entrance sign on the right side of the road across the highway from Loubert Road (entrance to the community of Stillwater). After turning right (onto a gravel road), drive up the hill and approximately 5 km in, you’ll be at the start of the Route, Lois Lake Campsite. NOTE: Caution should be used when driving on all logging roads and please keep headlights on. There also may be active logging in the area so please observe and obey all signs. If you’re not up for the full 5 days of canoeing and portaging you can get a ride to Windsor Lake and descend back down to Lois Lake (3 days) or get a head start from any point along the Goat Lake Main and take the usual route. Or, you can start at the beginning and canoe to Khartoum Lake (2 days). Whichever route you choose, paddlers are advised that there can be strong inflow winds blowing down Powell Lake from the North and that the portage from Goat Lake to Windsor Lake is a steep uphill climb. We suggest taking all the time you can to explore the beauty of this incredible chain of lakes. Your portages are often through beautiful old growth forest and the lakes are peaceful, serene, and generally calm. With any paddling, you’ll want to be prepared for your longer paddling stretches by watching and predicting weather patterns so you are not paddling through rough waves and strong winds. Paddle earlier in the day to avoid gusty winds and wind down at your campsite early to enjoy a great dinner, swimming, and the overall beauty of the area. The majority of the Powell Forest Canoe Route lies within a Working Forest managed by Western Forest Products. All roads except Canoe Main have restricted access and may only be used on weekends, or weekdays between hours of 8pm and 5am. Caution should be exercised at all times as there may be unscheduled traffic at any time. Drive slowly and cautiously and all signs should be observed and obeyed. Check local road info before you leave. A) Proceed to either Nanton or Dodd Lake drive-in recreation sites as they generally have recreational users during Summer months. B) Proceed to either Goat Main or Stillwater logging roads in order to flag down a vehicle. Before you go, file a trip plan and leave word with a responsible person indicating where you are going to paddle and when you expect to return. Report back to them once you have returned. All connector streams should NOT be portaged due to numerous falls, chutes and log jams. Keep local wind conditions in mind when paddling Lois, Horseshoe, Dodd, Goat and Powell Lakes. Wear a life-jacket or PFD and carry emergency supplies including extra food, a change of clothing, rain gear, a boat repair kit, First Aid, and survival equipment (including flares). Accommodations/Camping – Each campsite has picnic table, an outhouse, tent sites, and a fire ring (sometimes firewood) but bringing a cook stove is recommended. Some have docks for easy shore landing. Designated campsites are open to everyone for shared use on a first come, first served basis. Some sites are accessible by vehicle, others are not. Fires – Fires are allowed as long as there is not a fire ban in effect. Obey signage, use existing fire pits and dead wood only, please. Cell phones – Count on no cell reception at all, especially on the lakes where coverage is blocked by the mountains. Clothing – never travel without proper rain gear, footwear and spare dry clothing; you are on the coast and in the mountains where weather can change dramatically without warning. Levels of Difficulty – most of the canoe route is easy to moderate paddling, but cumulatively it can be a challenge even to the most seasoned experts. Bear Caches – At most sites a rope and pulley system can be located to hang food and garbage to deter bears and other predators. Always minimize risks by practicing Leave No Trace and pack out all garbage. Powell River Forest Service Road Information – All lakes on the canoe route are logging-road accessible. Please note that logging roads are only open for public use on the weekends and after 6 pm during the week. Call (604) 485-3132 for more information. Rentals & Equipment – Connect with local canoe, kayak, and paddleboard outfitters! Portage trail heads are marked with orange triangular markers. Canoe rests: on all Portage trails, single and tandem canoe rests can be located approximately 100-150m apart. *NOTE: all distances are in Metric with the exception of road mile markers. The main camp site at Lois Lake is medium-sized with a large parking area. It has separate day use and overnight sites. Caution should be used when paddling Lois Lake due to numerous submerged stumps and snags. Also be aware that winds can at times make the entrance from the lake into the bay hazardous. A side trip from Lois Lake can be taken in an easterly direction through an obvious narrows, ending up at Khartoum Lake. Along the way consider stopping at Lois Point Horsemans Camp, an alternate site for the canoeist that would prefer a quieter, more peaceful experience. Launch your canoe at Lois Lake and travel eastward along the Southern shoreline approximately 500 meters to the small point of land, and here you will find this site with an outhouse and dry firewood. The trail begins at a small bay on the northern end of Lois Lake. This scenic portage parallels the river on its eastern bank, with a small, rustic camp site approximately halfway along. There is also a camp site at the end of the portage. Under certain conditions, this southern end of Horseshoe Lake can accumulate a lot of drift material, therefore 4 different launch points have been established along the southern shore. Any activities on Horseshoe Lake should be taken with great care when winds are blowing. There are numerous sheltered bays and coves as well as small islands suitable for refuge if caught in unfavourable conditions. At the northern end of Horseshoe Lake, just east of the narrows, is Little Horseshoe Creek recreation site. It is a small rustic site and is only accessible by canoe. It serves as an alternate to the Nanton Lake site which can sometimes be overcrowded. This site is also at the beginning of the Little Horseshoe-Beaver Lake alternate portage route. Once into Nanton Lake, you have a choice of two recreation sites: The main Nanton site is on the west side of the lake (and has vehicle access), or a small site that is canoe-access only and is 300m up from the entrance of the connector stream. At high water one can canoe to the site on the stream, but during periods of dry weather you may have to use the low water portage. This portage follows along the western edge of the Horseshoe River and passes through the moist, deciduous lowland ecosystem that supports and abundance of wildlife. There are numerous cedar walkways and bridges crossing a network of feeder streams and marshes. There are two recreation sites along the portage. A small, shallow lake with a camp site at the southern end. The next portage begins on the eastern shore at the mouth of a small connector stream, adjacent to a small rest area. There is also a remote access rec site at the north end of the lake. This is a relatively short portage with a gentle adverse grade built to avoid a portion of the Horseshoe River which has several large log jams and is very dangerous to canoe at any time. It terminates at the Dodd Lake (vehicle access) recreation site. A large, open lake that in warm afternoons can be subject to sudden wind squalls. Either shore can be followed, and winds usually abate by 5pm. There are three recreation sites on Dodd Lake. The large, main site on the southwest end can be accessed by vehicles so it is not favoured by canoeists seeking the wilderness experience. The two small campsites at the southeast corner and northeast end of the lake are accessible by water only and offer a good alternative to the main site. Please carry out what you bring in and do not bury or leave any garbage. This route starts at Little Horseshoe Creek recreation site and travels in a northeast direction to Little Horseshoe and Beaver Lakes, terminating at the recreation site at Dodd Lake. There is more portage than paddling, but it allows canoeists with limited time to start at either the Nanton or Dodd recreation site (both have vehicle access) and circumnavigate a smaller area. This is a short portage that follows an old corduroy road built in the 1930’s for the extraction of forest products. The portage starts at the recreation site located on the small lagoon at the north end of Dodd Lake. The landing at Dodd Lake is the original landing site used to supply old logging camps in the area. There has been logging done along this portage as a clean up measure to prevent pest infestation and fire hazard from extensive winter storm blowdown. Windsor Lake is the highest lake in the circuit at an elevation of 196m. It is one of our colder lakes and has a small recreation site at the north end which is only accessible by canoe. This is the most difficult portage on the route. It descends from Windsor Lake (elev. 196m) to Goat Lake (elev. 85m). The beginning of the portage climbs slightly to where it crosses a logging the road before it begins a rapid descent to the Goat Lake recreation site. Caution should be taken when crossing the active logging road. A large, fjord-like lake with two recreation sites which are only accessible by canoe. A side trip may be taken up the lake to the mouth of the Eldred River. At the southwest end of the lake you will pass through a narrows linking Goat Lake to Powell Lake. Caution should be taken when paddling through the west end of the narrows due to submerged stumps and snags. Unmaintained trail! A short portage with a slightly adverse grade for the first 200m. The trail follows an old railroad grade used for hauling logs from the Inland Lake drainage to Powell Lake. There are camping/resting areas at each end of the trail. A beautiful, recreational canoeing lake with several sandy beaches and good fishing. The lake has two Provincial Park sites: a remote access site on Anthony Island and a vehicle access campground on the southern end. The site on the island is accessible by boat or by hiking. It is located just off the northeastern shore and connected by a bridge to the trail. The Inland Lake campground is a large vehicle oriented site with ample parking and with unrestricted vehicle access makes for a good alternate termination point for the canoe route. This site has a caretaker and the gate is locked at night and vehicle security has not been a problem in the past. Inland Lake also has a level, 13km trail completely surrounding the lake with several rest areas along the way. There is also a short trail/portage to Lost Lake which is a small, marshy-edged lake that drains into Inland Lake. This lake should only be paddled early in the morning or late afternoon since the local winds are very strong. The winds usually pick up around noon and abate by 5pm. Extra care should be taken at all times when canoeing this section. Approximately a quarter way down Powell Lake from its connection with Goat Lake is Fiddlehead Landing, the site of a small free to use overnight hut built primarily for hikers on the Sunshine Coast Trail. Approximately half way along the southern shore of Powell Lake, east of the small, unnamed island, is the Powell Lake recreation site. This small, rustic site has a sandy beach and provides good refuge from the afternoon winds. Powell Lake has many privately owned cabins along its shore and with the exception of emergencies, their floats and facilities should not be used. The sites on this lake are all user maintained by paddlers and local cabin owners. The southern shore is the preferred route while canoeing west on Powell Lake, and the eastern shore should be used when canoeing south. There are two other campsites on Powell Lake – one situated at the beginning of the Powell-Inland portage and the other is located at Haywire Bay at the southeast end; it is a Regional District Campground so there is a fee for it’s use. Forest roads and forest recreation sites and trails are in remote areas in natural surroundings where rapidly changing conditions and hazards exist. Persons using these facilities are advised to use caution at all times. Powell River is on Highway 101, about 4-5 hours north-west of Vancouver. Although Powell River lies on a mainland highway, it requires two ferry rides, (Horseshoe Bay to Langdale – paid, and Earl’s Cove to Saltery Bay – free) to reach the hub of the Upper Sunshine Coast. Once in Powell River, travel by car is recommended, but options include municipal and rural public transit, taxi, biking and walking. Find more info here. Share your adventure with us on Facebook, Twitter, or Instagram using hashtag #sunshinecoastbc.